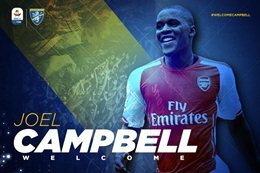 Arsenal have confirmed through their official website that Costa Rica international Joel Campbell has ended his seven-year association with the club after joining Frosinone Calcio. The striker has penned a three-year deal with the newly promoted Italian Serie A club and departs Arsenal with 4 goals in 40 appearances for the first team. During his time with the Gunners, Campbell spent time on loan at Lorient, Olympiacos, Vilarreal, Sporting Lisbon and had two spells with Spanish side Real Betis, where he spent the whole of last season. The 79-cap Costa Rica international previously played for Liga Deportiva Alajuelense, Saprissa and Puntarenas in his homeland. Stephy Mavididi is the other striker that has departed the Emirates outfit, having agreed a deal with Italian champions Juventus but he is likely to play for their B team in the new season. An England U20 international, Mavididi's contract with Juventus will run out at the end of the 2021-2022 season.